Kiwi is not only a delicious tropical fruit low in calories, but it is also packed with nutrients and provides numerous health benefits. Learn more about its history and its many medicinal applications. Originally from northern China, kiwi was referred to as Chinese gooseberry until the early 20th century. It wasn't until it was brought to New Zealand to be cultivated commercially that it received its new name – kiwi was chosen because the round and brown mature fruit slightly resembles the national bird of New Zealand. Kiwi has recently been the subject of much research investigating the fruit's numerous health benefits and medicinal uses. Aiding digestion. Kiwi can help the digestive system break down food proteins, relieving some symptoms of digestive ailments. Improving sleep. Research indicates that eating kiwi can reduce the amount of time it takes to fall asleep as well as improve sleep quality and duration. Promoting cardiovascular health. Kiwis help reduce components in the blood that can damage the heart. Boosting the immune system. It is thought that kiwi may improve functioning of the immune system and therefore reduce severity of illness and infection. Kiwis contain an enzyme called actinidin, which is known for tenderizing other foods, especially proteins. When consumed, actinidin can help the body more easily digest protein-rich foods. The antioxidants in kiwi fruits, along with several polyphenols, have been shown to reduce the amount of platelets (coagulant agents) and plasma lipids (which carry triglycerides and cholesterol throughout the veins), and also decrease blood pressure, which reduces the risk of serious heart disease. 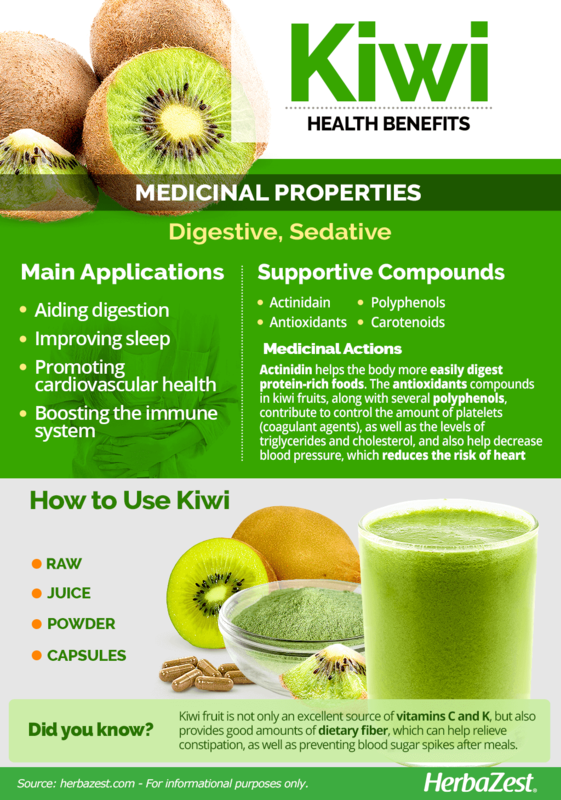 These compounds, as well as carotenoids and dietary fiber, are also likely to be involved in kiwi's ability to strengthen the immune system, although the exact mechanism of action is still not completely understood. Kiwis contain fair amounts of plant-based serotonin, which is a well-known neurotransmitter that regulates mood, sleep, and anxiety in mammals. Other herbs with digestive properties are apple and papaya, while passion flower and lettuce share similar sedative effects. Kiwis are mostly safe for consumption, but they are associated with some side effects. The hairs on the skin of the fruit may cause throat irritation if ingested. Kiwi may also cause allergic reactions in some people, especially those who are allergic to latex. Symptoms of allergies to kiwi include difficulty swallowing, vomiting, and hives. Kiwis may increase bleeding, so those who have bleeding disorders or are taking medications that affect blood clotting should avoid kiwi products. Kiwi may also be dangerous for people who have problems with low blood pressure or who are taking medication for high blood pressure. Additionally, kiwis may increase the risk of kidney stones due to a high concentration of oxalate in the fruit. Taking kiwi was a supplement, especially during pregnancy or breastfeeding, should be medically supervised. Kiwi fruits have great nutritional value. They are an excellent source of vitamin C, which not only boost the immune system, but also encourages collagen formation, as well as vitamin K (phylloquinone), which aids proper coagulation, as well as promoting bone mineral density. The small kiwi fruit is also high in dietary fiber, necessary for good digestion and sugar metabolism; copper, a trace mineral that participates in red blood cells production and help carry oxygen throughout the body; and vitamin E (alpha-tocopherol), which helps the immune system to fight off invading bacteria and viruses, as well as supporting cardiovascular health and cellular functions. Other compounds provided in adequate amounts by kiwi, are potassium and vitamin B9 (folate), along with small quantities of many other important vitamins and minerals, which contribute to round up kiwi's nutritional benefits. 100 grams of kiwi fruit provide 61 calories, as well as 5% and 12% of the daily value for carbohydrates and dietary fiber, respectively. Kiwi fruits are widely popular for their taste, and are usually consumed fresh and peeled. 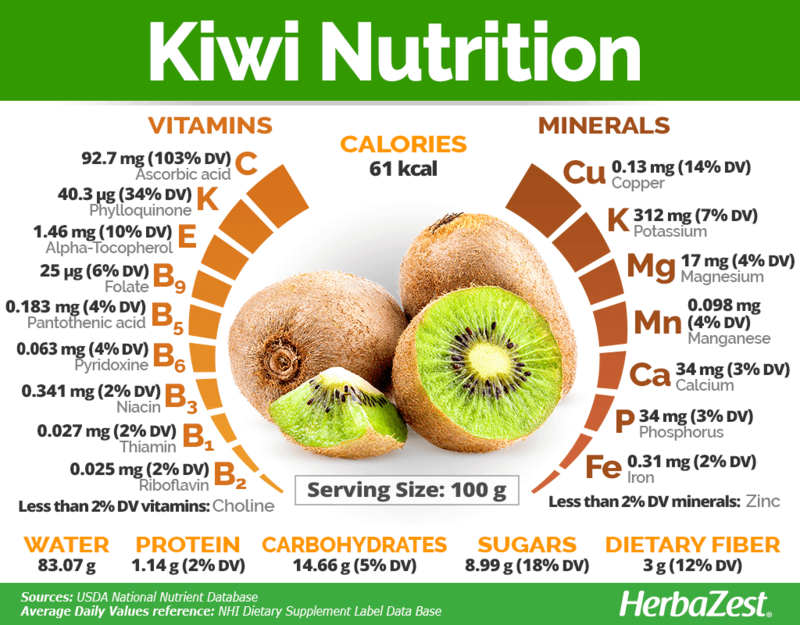 Kiwi makes a great addition to fruit salads, desserts, and smoothies; however, it can be consumed in supplemental forms. Raw. Eating kiwi raw is the most common way to reap its digestive and relaxant benefits. Juice. Another way of obtaining the nutrients contained in kiwi fruit is taking it blended or juiced, alone or mixed with other fruits and vegetables. Powder. 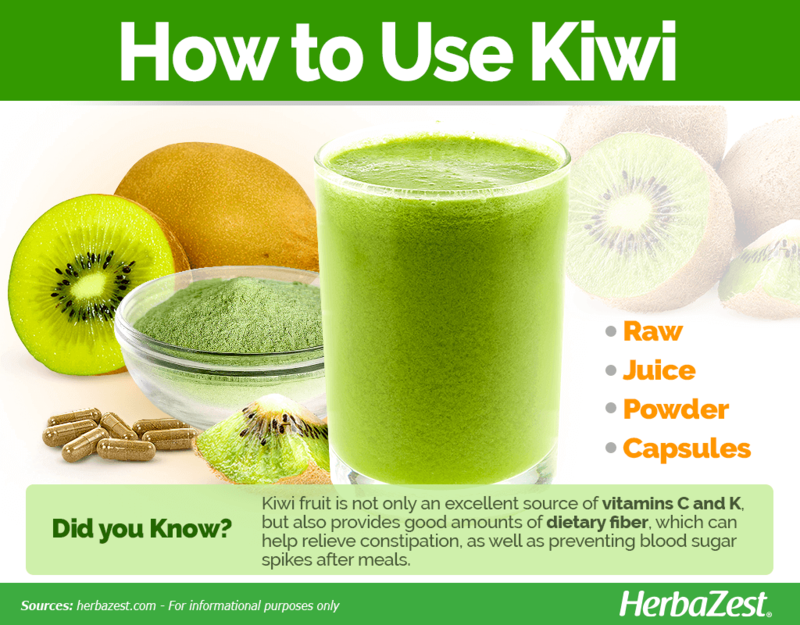 Kiwi powder can be mixed with juices and smoothies, and it is useful in aiding digestion. Capsules. 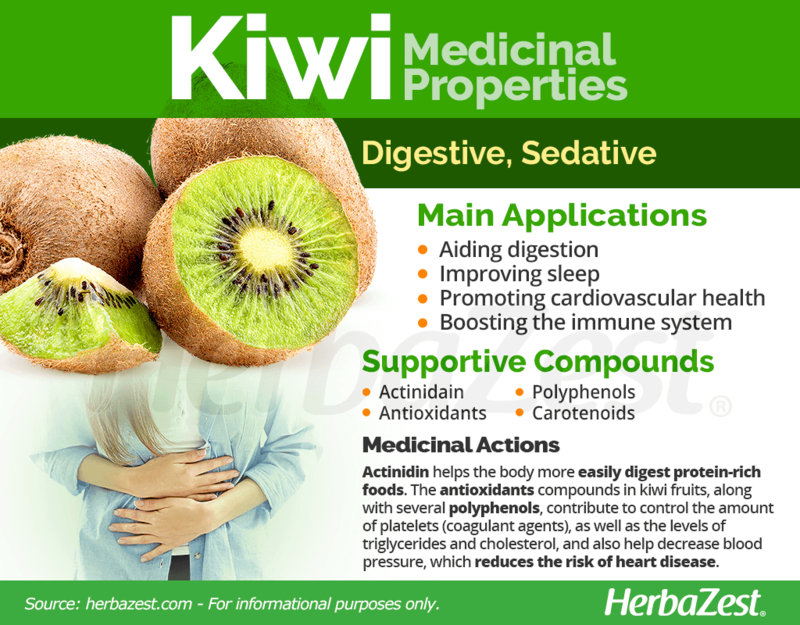 Capsules are a fast and easy way to consume kiwi in order to assist digestion and boost the immune system. Kiwi enjoys worldwide popularity, so it can be found in most grocery stores. In some places, it may be available at local markets as well. On the other hand, kiwi powder can be purchased from online retailers. Kiwi supplements are most widely available online, but can also be found in health stores and capsules may be in vitamin stores. The kiwi vine is typically cultivated in mountain rainforests at an altitude range of 2,600 - 4,600 feet (800 - 1400 m). However, there are many varieties adapted to different climates. That being said, kiwi can be cultivated in a home garden as long as some basic requirements are met. Kiwis need lots of space to grow. They need to be planted 10 - 15 feet (3 - 4.5 m) apart in a sheltered, sunny position. For successful pollination, the male plant should be located two feet (60 cm) away the female one. Using this technique, up to eight females can be pollinated by one male. When young, kiwi plants are vulnerable to frosting during the spring, so protection against the elements is needed. To optimize their growth, they need fertile, well-drained, and slightly acidic soil with plenty of organic matter. Some level of moisture is required for optimal development, as well as full sun or partial shade. More detailed information about growing kiwi can be found in the herb garden section. The kiwi plant is a deciduous climber and can grow up to 30 feet (9 m) tall. It has heart-shaped leaves that may grow to be as large as 10 inches (25 cm) across, and it grows white, fragrant flowers. 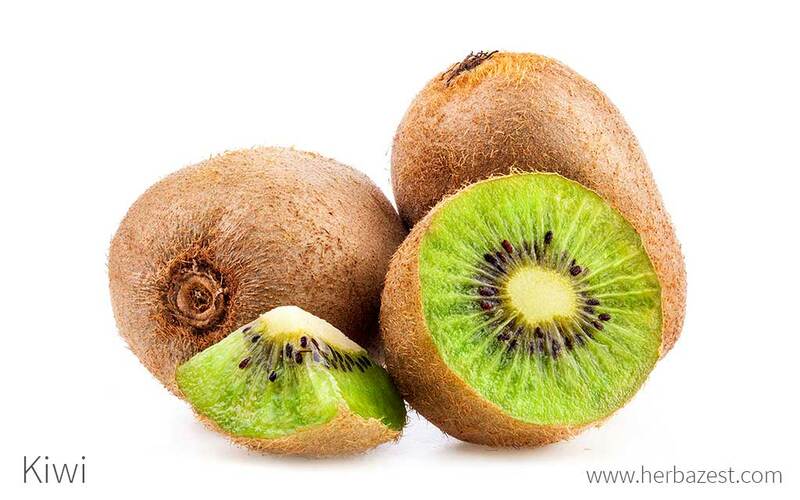 The kiwi fruit is a round to oval berry that has brown, fuzzy skin. Its flesh is bright green with small, black, edible seeds. Kiwi is officially called 'kiwifruit' in New Zealand to distinguish it from the kiwi bird, and it may occasionally still be referred to by its old name, Chinese gooseberry. The kiwi plant, Actinidia deliciosa, belongs to the Actinidiaceae family, which is composed of woody vines, shrubs, and trees that typically grow in Asia, Central America, and South America. It is cultivated in mountain forests. Kiwi genus name, Actinidia, is derived from the Greek akinos, which means 'ray' and was given to describe the radial appearance of the inside of the kiwi fruit. Most kiwi cultivars comes from China, where there are wild-growing populations of A. deliciosa. One of the most important and globally-traded kiwi cultivars is 'Hayward.' However, others like 'Qinmei' - from the Qinling Mountains - aren't commercialized outside of the country due to their mild flavor and comparatively short shelf life. In addition, 'Hayward' has been used to pollinate the 'Koryoku' variety in Japan, and is also cultivated in southern California, mixed with New Zealand selections, like 'Abbott' and 'Allison'. The kiwi plant is native to eastern China, where it still grows in the wild, but it began to be produced commercially for the first time in New Zealand in the early 20th century. It became popular with Americans during World War II, when American servicemen were stationed in New Zealand, and they brought their love of the fruit back to America with them, expanding the kiwi's global reach. The kiwi fruit only received its current name in 1962, as part of an effort to improve the market appeal of the fruit. The four largest producers of kiwi fruit worldwide are China, Italy, New Zealand, and Greece. China is the number one producer; the Food and Agriculture Organization of the United Nations (FAO) does not have exact data on Chinese agriculture, but estimates the amount of kiwi produced in China in 2014 to be 1,840,000 tons. Italy was second with 506,958 tons, New Zealand produced 410,746 tons, and Greece produced 171,510 tons of kiwi. Meat tenderizer. Because it contains enzymes that break down the collagen in meat, kiwi can be used as a homemade meat tenderizer. Beverage industry. Kiwi fruit compounds are also used in some sports drinks. Personal care. The active compounds of kiwi fruit are used in creams, soaps, and other skincare products. Fresh kiwi can also be crushed and used as a homemade exfoliating agent. Decoration. Kiwifruit's fragrant flowers have ornamental uses. Kiwi's popularity and widespread commercial production make it an easy fruit to find, and its medicinal properties, especially its digestive, sleep-inducing, and cardioprotective abilities, make it a wonderful addition to any fruit lover's diet.